On Thursday the 7th of March, trading on the euro closed 1 pip down. The day’s candlestick had a range of 39 pips. The drop to 1.1285 was brought about by rumours that the ECB is set to downgrade the Eurozone’s economic growth and inflation forecasts at today’s meeting and to start issuing new loans. The US dollar showed mixed dynamics against the major currencies following the release of US economic data. The ADP employment report fell short of expectations. This allowed the euro bulls to recover their losses and reach a new intraday high. 11:30 UK: Halifax house prices (Feb). 16:30 Canada: building permits (Jan). 16:30 US: initial jobless claims (25 Feb). The bears didn’t manage to reach the reversal zone of 112 – 135 degrees by 17:00 (GMT+3). The bulls bought up euros as the 1.1290 low was revisited. After a rebound, a triple base was formed with a double bullish divergence on the AO indicator. The signal was strong, but Mario Draghi, whose words can overturn any price model, was much stronger. Growth came to a halt at the LB balance line. Market activity was low in the Asian session, so the LB line is now providing solid resistance. The trend line has been broken and we’ve now got a 50% rebound. The market is ready for some wild fluctuations. Going by technical analysis and the formations we’ve seen over the last 3 days, our target zone ranges from 1.1355 (U1) to 1.1366 (67th degree). You can ignore the indicators during Mario Draghi’s speech. After the ECB meeting, markets will start preparing for the US payrolls report. Considering that the ADP report came out lower than expected, the dollar will remain under pressure until Friday. I think that we’re going to see some intense swings on the euro. The euro crosses are trading down, except for EURCAD. 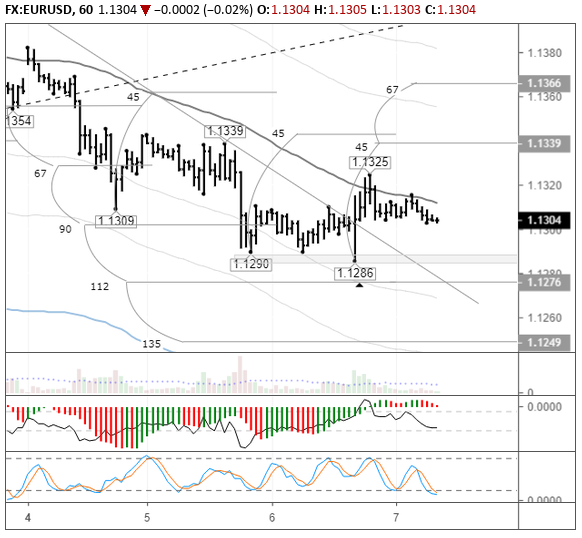 This means that the EURUSD pair may test 1.13 before rising any further. The ideal scenario for this pair is to trade flat along the LB line up until 16:30 (GMT+3).